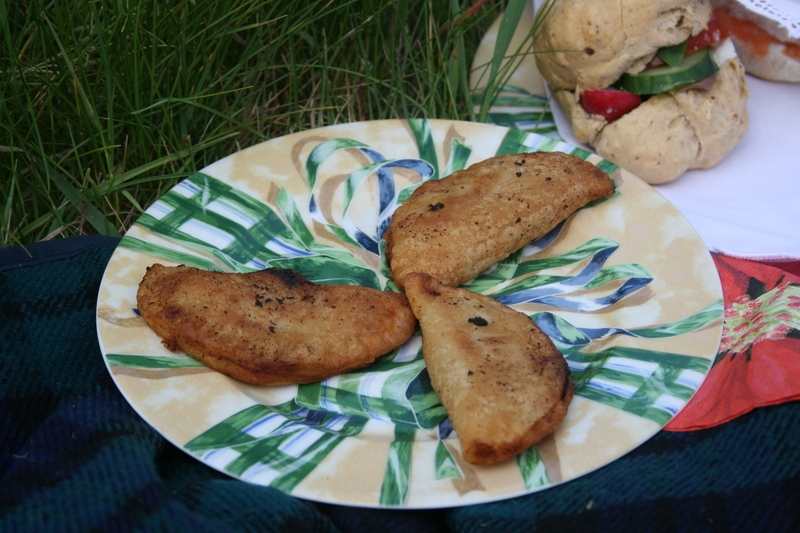 It is really a small coca or empanada but stuffed with a “frita” consisting of fried sweet peppers, fried tomatoes, garlic and anchovies. 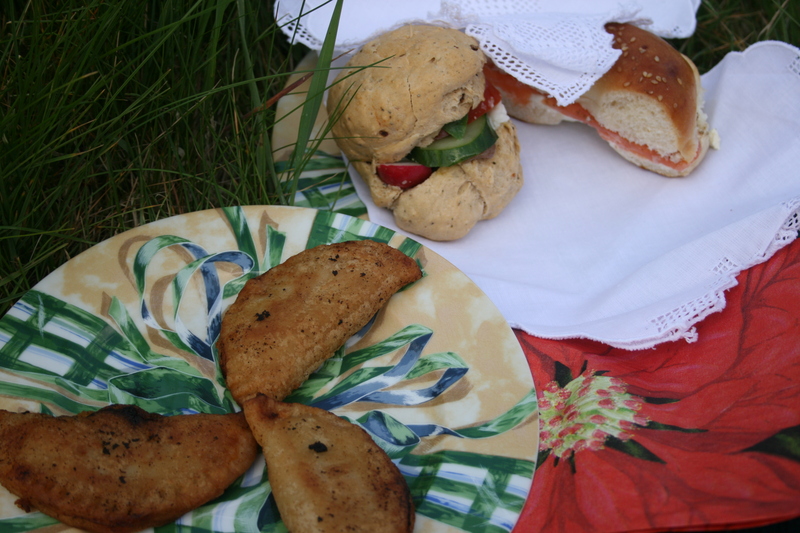 It is made as a starter or as an nibble to enjoy over a glass of dry sherry. Plunge the tomatoes into a bol of boiling water then remove them and peel them with a sharp knife. The blistered skin will come off easily. Core and cut them up and squeeze some of the seeds out but do not worry if there are some left. Clean the peppers and put them under the grill to blacken the skin. Once cooled, most of the skin will peel easily. Fry the cubed tomatoes and the chopped garlic. Add strips of peppers. Cook until soft and mushy. Then add some bits of anchovy into the cooled mix. This means no extra salt is needed! Add a little black pepper. Reserve in the fridge until you need it. This filling can be done ahead of time and even frozen if necessary. The trick for this dough is to throw the whole lot of the measured flour into the salted and boiling water in ONE go! Add the sugar and olive oil. Turn speedily with a wooden spoon and turn the heat off when the dough comes away from the sides of the pan into a glossy ball. Let it to cool aside. Again, this dough can be made the day before or kept in the fridge for a few days. This amount will make a good baker dozen of coquetas. When you are ready to assemble, spread the dough on a cool clean surface with a floured rolling pin. Keep it as thin as you can but not to breaking point. Keep it floured so it does not stick to the surface or the pin. Cut up circles with a large scone cutter or a sharp knife around a small saucer. Place a small amount of filling in the middle and join the two sides like a Cornish pasty, pressing the edges down with a fork. Prepare a thick bottom frying pan with a good glass of oil in it. When the oil sizzles around a pea of dough, lower each coquetas and fry until both sides are nice and brown. Drain on kitchen paper and serve warm or at room temperature with the aforementioned glass of sherry! Some black olives are good with it too. Some recipes are heritage. I confess that I am excessively thrilled to be now making coquetas at home and teaching my children how to do them. And even though they not as good as Manille’s, they are pretty close!